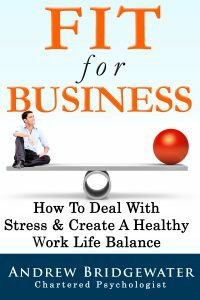 I wrote ‘Fit for Business’ to help you find true meaning and peace of mind in your work. Stress and overthinking can so easily leave us feeling empty and unfulfilled, not to mention burned-out. I experienced these challenges in a big way and was admitted to a psychiatric hospital for 5 weeks in 2006. As a qualified psychologist suffering from severe anxiety and depression, I could find little in the way of practical help or support. After being released from hospital and spending 18 months on antidepressants, I’d gained nearly 4 stone in weight and finally resolved not to live like this any more. The recovery story and everything I’ve learned is recorded in “Fit For Business” and I want to be able to make a real difference in your life too. Why allow stress and negative feelings to steal your peace of mind and ruin your quality of life? You can find peaceful, clearer thinking and the natural vitality and energy that is your birthright.